Red, pink or pale white, they might be mistaken for bits of flotsam or strands of eel grass. They might be all around or buried safely in the mud and they might, odds are, drive you crazy. When Nature calls up cinder worms to begin their millennia old spawning ritual on salt ponds, somehow, Nature also calls in schools of bass. If your timing is right, the water’s not too cool and you’re not prone to frustration, the fishing can be nothing short of fantastic. For several years, Dave Pollock and Capt Ray Stachelek have taught hundreds of people to tie their own flies at the Cinder Worm Workshops at Charlestown’s Kettle Pond Visitors Center, offered through the US Fish and Wildlife Service and RIDEM. Their most recent night was packed with more than 60 men, women and children, all happily bent over vices, tying red and pink material for a day on the water to close the training. Dave’s an executive board member of the RI Saltwater Anglers AssociationRI Saltwater Anglers Association and Ray guides fishermen with his Cast A Fly Charters on a beautiful Everglades center console. They teach the basics and finesse tricks of fly tying to match the magic of the worms annual emergence and ritual dances. Cinder worms, Neresis limbata to be precise, are segmented polychaetes who happily exist in the mud of salt ponds and back waters. They intake oxygen through their skin and wait for May and June’s warmth to bring water temperatures into the mid-sixties before heading for the surface to mate. Most people know this ritual as a “hatch”, which likely was a result of trout fishermen watching them rise but really it’s more of an excited dance. With the moon’s pull being a factor, they search for mates then shimmy and shake to emit eggs and sperm before returning to the mud. In a purely fantastic gift of Nature, they quickly develop a tiny paddle-like appendage on their hind section known as an epitoke, which helps them move around the surface. When lucky mates are located, it’s that epitoke which delivers the goods and the band plays on so when conditions are just right, all hell breaks loose on the surface and the stripers wait for it. The show might be brief as weather dictates or last all night and waters need to be pretty close to calm. Some practiced captains will skip the nighttime splashing and wait for dawn with its better visibility, knowing bass will stick around to feed on something else after the party. To land a bass among all those worms means you’ve got to be noticed; pack a few colors and shades of red, pink and maybe something fun like pearl. Giving worm imitations frequent wiggles is critical to impersonating the real deal and maybe hook it wacky-rig style to keep its presentation off balance. Capt. 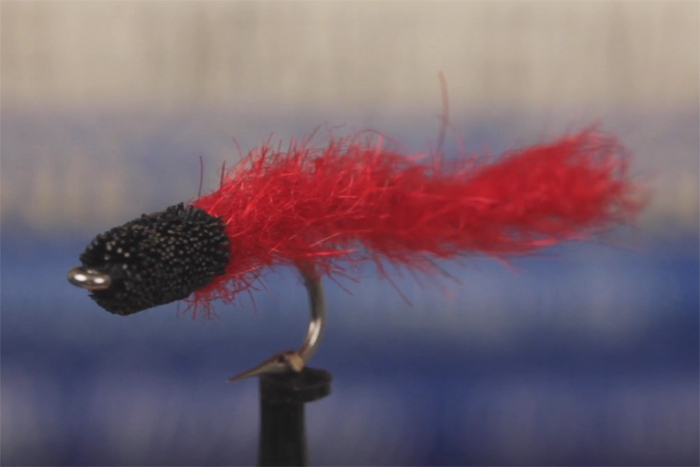 Stachelek prefers tying firm bodies for his flies and avoids maribou, which can be more fluid and therefore attract less attention on the surface. It’s not uncommon for frenzied bass to strike a white plastic similar to a Cocahoe Minnow or small Ron Z’s but then again, they may not. If the dance is on, try fishing a slightly larger fly just outside of the frenzy as a way of attracting those big and lazy bass who lounge around waiting for the easy meal. Stay back a bit, look for ripples signalling wiggling worms, throw that big fly to the far edge, with quick retrieves of just a few feet, work the worm through the circus, then cast again. Most importantly, don’t take it on the chin when surrounded by the sounds of slurping and your line keeps coming back with only the tug of eel grass. These are powerful events with the possibility of acres of worms so to be seen, you’ve got to stand out. Go big and change colors to match the, well, hatch. Then, if everything falls into line, you hook up. 22″ on a red cinder work fly from The Saltwater Edge. Bingo. So frustrating, so rewarding, so much fun on a salt pond in June. If all this worm talk inspires you to tie you own, Scott Travers does an excellent job organizing classes through DEM’s Aquatic Resource Education program. For the next few months, Scott’s hosting fly tying classes in Gloucester, Coventry, Greenville, Harrisville and Cumberland. These are fine opportunities in an easy atmosphere with tying experts and while they’re free, they do require registration, which you can do at DEM’s ARE website or by contacting Scott at Scott.Travers@dem.ri.gov.